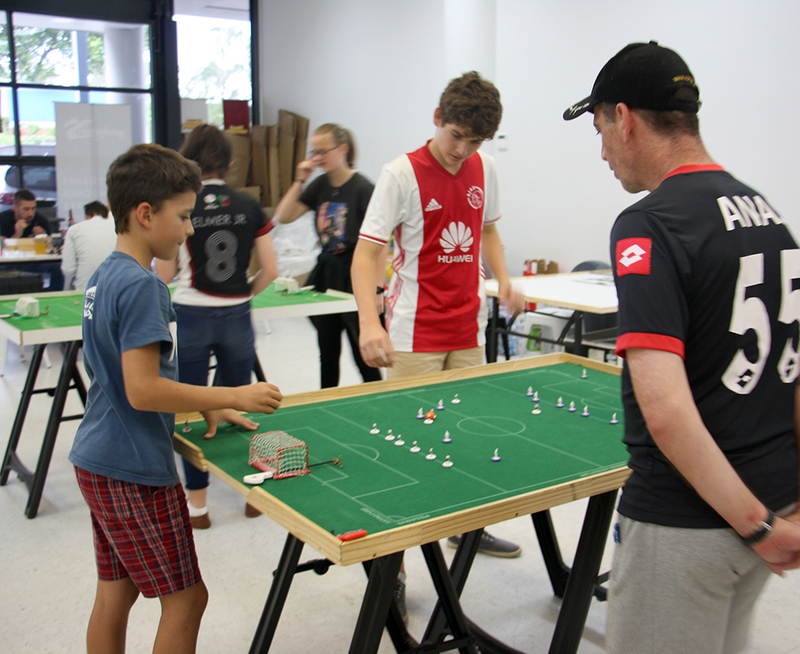 School holidays can only mean one thing, the return of Subbuteo Parramatta’s Junior Subbuteo Tournament. This autumn, the club took the opportunity to try out a new venue – the newly opened Good Games store in Bella Vista. Suffice to say all who attended were impressed by the space, the lighting and the hospitality provided, so much so that the club has now decided to use the shop as their new permanent clubhouse. Seven players lined up for the tournament and, for the first time in Australian history (maybe even the world, anyone got access to all the records?! ), the females outnumbered the males in an open tournament. With a couple of those involved in their first ever junior tournament, the future looks bright. Players were divided into two groups. WASPA rankings were used to seed two players into each group, the others placed randomly to fill them up. Oliver was the dark horse – not having played as many tournaments as others, his ranking didn’t place him as a seeded player, but his intense practise over the last 6 months meant that he was poised to give the seeded players a shake. The group games were all very even, with 2 goals being the greatest margin in any fixture. At the conclusion of the group matches, the places all went according to seeds, except for Group Two, which turned out to be something of a group of death. Oliver made good on his dark horse status, taking his place at the expense of Imojjen, who lost both her fixtures in incredibly close 1-0 results to Oliver and Jonty. Meanwhile, Jonty and Oliver, with identical results and a head-to-head draw, had to go to a shootout to decide first and second place in the group. Oliver came out on top in a tight tussle. In the repechage, Imojjen beat the day’s youngest competitor, Catherine, by a single goal to set up a final game against her good friend, Maddy. The two then played out a scoreless draw, the fatigue of a few hours’ straight Subbuteo play taking its toll. The semi-finals saw Daniel line up against Jonty and Oliver faced Æowyn. None of the players could be separated. Oliver and Æowyn both put the ball in the back of the net during their game – Oliver while the referee had stopped play and Æowyn 5 seconds after the half-time whistle – but couldn’t break the deadlock during normal play. Likewise, Daniel and Jonty played out a scoreless draw and so both semis went to shots. Oliver took a straightforward 2-0 shots victory over Æowyn, but Jonty and Daniel needed 10 shots each before they could be separated! Fatigue definitely set in for Æowyn in the 3rd/4th play-off, with Daniel running away with a 3-0 victory. Meanwhile, Jonty and Oliver renewed their group game rivalry and, again, couldn’t be separated. A goal to each left them with their second shootout of the day. This time, however, Jonty turned the tables, taking the match, and the title, with a shot to spare. 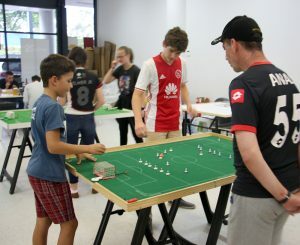 An excellent afternoon of Subbuteo with fairplay and friendliness a feature throughout. A big thanks to the parents who brought their children along and hung around to referee and give coaching tips. A big thanks to the Palamaras and the Sirmais who trekked from the opposite side of the city and many many thanks to our wonderful host venue, Bella Vista Good Games. The juniors will be back next holidays! 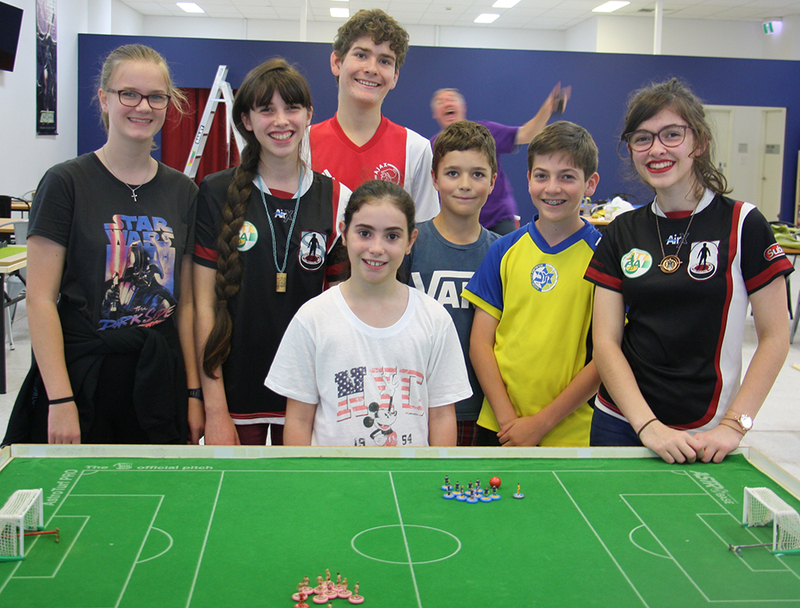 This entry was posted in News and tagged good games bella vista, junior tournament, subbuteo parramatta, waspa, waspa tournament on 27/04/2017 by ajebec.